When you’re involved in “the industry”, sometimes you can get a little spoiled or even jaded attending concert after concert and event after event. Things kind of become “old hat” and you feel like, “Oh I’ve been here before”. This could be even more so stated for my wife and I as we attended the “Heart of the City” tour this past weekend during its two Chicago stops. We’ve both worked closely (in different capacities) with the two “New York Giants” of the Hip-Hop & R&B game…her with Jay-Z, me with Mary J. Blige. We weren’t like most fans in attendance who spent their hard-earned dollars to see two of the greatest do their thing, but we are fans nonetheless. When “Hova” and “MJB” hit the stage of the United Center, all those indifferent thoughts were put to bed and we once again witnessed why these two are two of the greatest who’ve ever picked up a microphone and Chicago showed them the love they deserved. When 8pm hit, the Chicago Bulls theme song began to play and some fans were surprised by an opening set from songwriting phenom, The Dream (Mariah Carey’s “Touch My Body, Rhianna’s “Umbrella”) who also served as a host for the show. Dream set things off on a high note with his hit single “Shawty Is A Ten” with several provocative female dancers in tow. He followed that up with his current single, “I Love Your Girl” and finished it off with the even more risque “Falsetto” which contained more bumpin’ and grindin’ then an R. Kelly concert. Dream ended his set with a witty dialogue to kill time and then after he exited the stage the countdown literally began to the main event. After a 15 minute intermission, the lights went out and a video interview montage with Mary J and Jay-Z appeared on opposite sides of the stage. This sent the super diverse crowd which ranged from the barely post teen to the “old school” into a frenzy. 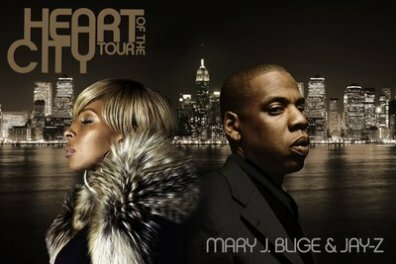 As the video faded into a helicopter view of the New York City skyline, the large curtain onstage dropped to the ground revealing Mary and Jay standing back to back in their shining glory. The two icons appropriately kicked things off with their classic collabo “Can’t Knock The Hustle” off of Jay’s legendary debut album, “Reasonable Doubt”. From that point on they enticed the crowd by making brief appearances in each others sets on songs like Mary’s “Real Love (Remix)” sans Notorious B.I.G. and Jay’s “Song Cry” from “The Blueprint” album. However it was ladies first as Mary tirelessly performed hit after hit…sometimes only enlisting accompanying vocals of the sold-out crowd on songs like “I’m Goin’ Down”, her rendition of Chaka Khan’s “Sweet Thang” and the mad black woman’s anthem, “Not Gon Cry”. We even got treated to a little bit of theater on songs like “Your Child” as she had an interpretive drama ensemble act out the lyrics. Mary commanded the audience as she ran through her entire catalogue bringing the house down on songs like “No More Drama” and ending things on a happy note with her single “Just Fine”. After Mary ripped the roof off the United Center, u would think the crowd would’ve been exhausted….wrong!!! The video montage started again and chants of “Hova, Hova, Hova” began and the calls were answered. As the small orchestra began to play, “Jigga-man” himself rose from underneath the stage displaying the all too familiar “Roc-A-Fella hand signal”. Jay kicked it off letting us know that the “Roc Boys” were definitely in the building and like Mary, he effortlessly smashed his entire catalog…barely breaking a sweat. At one point he even took us to the club and played classics like “Who U Wit”, “Money Ain’t A Thang”, and “Feelin It” before he let the crowd decide he was going to perform “Big Pimpin'”. As he has on many other tour stops Jay couldn’t resist a little hometown politics as he asked the crowd if they were ready for change and threw up a huge pic of Barack Obama which drew thousands of applause and cheers. After Jay performed his “Encore”, my wife and I decided to make our way to the door to beat the parking lot pimpin and gridlock. As we made our way through the aisles, Mary and Jay re-united one last time to perform the title track for the tour. The love was definitely in the room for these two music icons and all those who paid $150 and up for their concert tickets definitely got there monies worth and then some.